Defence Minister Mansur Dan-Ali on Monday directed the Chief of Army Staff (COAS) Lt.-Gen. Tukur Buratai to relocate to the northeast until there was improvement in security situation there. He gave the directive at a meeting with the service chiefs as well as the Army Council and Navy Board in Abuja. Dan-Ali also directed the Chief of Defence Staff (CDS) Gen. Gabriel Olonishakin to effect changes in the operational commands of Operations Delta Safe, Lafiya Dole, Sharan Daji and Awatse in Niger Delta, Northeast, Zamfara and Southwest respectively. In a statement by the minister’s spokesman Tukur Gusau, a Colonel, the changes were to enable the military meet up with current threats and security challenges. 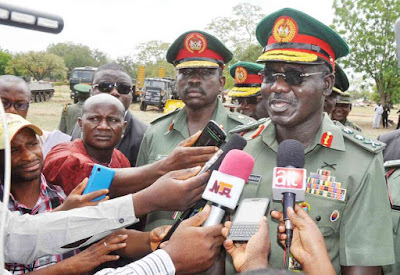 He said: “Similarly, the General Officer Commanding, 8 Division, Nigerian Army was directed to relocate his Tactical Headquarters from Sokoto to Gusau, Zamfara State to oversee the conduct of Operation SHARAN DAJI. To show concern to the welfare needs of members of the Armed Forces, the President has directed the enhancement of the welfare of troops particularly those serving in operational areas within the country, said Gusau. He said the Council/Board also considered and approved the promotion of qualified senior military officers to their next higher ranks.